Quality Assurance (QA) is an essential feature of our monitoring program. We have prepared and strive to follow a QA Project Plan (QAPP) that defines the standards and methods used to ensure consistent sampling procedures and that data generated in the monitoring program are accurate, complete, and representative of actual riverine conditions. Data collected are to be of a known and verifiable quality sufficient to meet the overall objectives of the monitoring program. Field and laboratory staff follow strict protocols for collecting and processing samples, maintaining and calibrating meters and equipment, and managing data. Duplicate samples are collected and split in both the field and lab. Chain of custody procedures are followed to ensure that sample integrity is maintained during all phases of sample handling and analysis. All procedures are thoroughly documented, with exceptions noted. All data are reviewed for quality at several steps along the path from collection to data publication. Personnel are trained on a regular basis and all features of the program are compared against the data quality objectives. 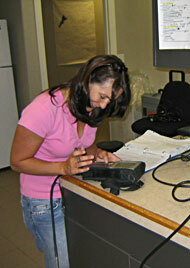 Melissa Thompson calibrating a water quality monitoring sonde at the IDEQ laboratory. 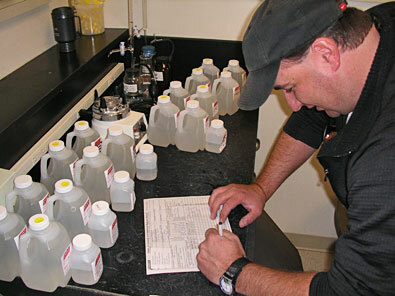 Chris Wilhelm completes Chain of Custody forms for water samples prior to shipping to the laboratory.